Bedroom is the coziest room from all rooms inside a home. In a bedroom, we can get high quality sleep and rest and it is good to influence our health. Our kids need best quality sleep to that’s support their growth. Based on that important fact, I realize that we have to decorate our bedroom if we want to get best rest and sleep. But for kids’ bedroom, we need to design the bedroom attractively to make the kids feel endure to stay there. 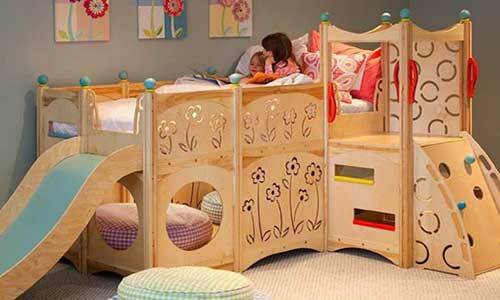 How about create a playground in kids’ bedroom? 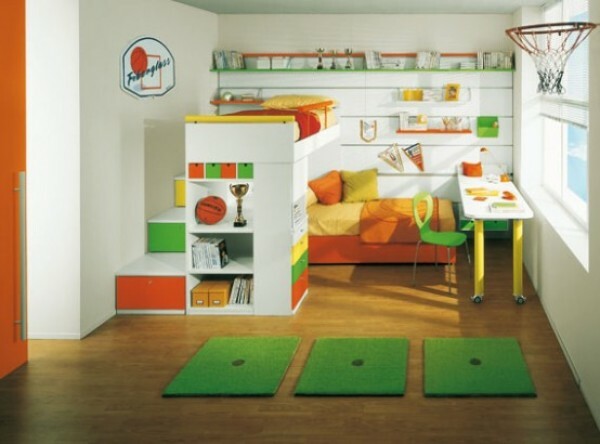 I have some playground bedroom designs you can try to make your kids’ bedroom looks interesting. First playground bedroom design that’s the simplest one is place a unique bed frame in your kids’ bedroom and decorate the walls using same themed wall murals. For example, you can place a car shaped bed frame in a bedroom with race course wall murals. 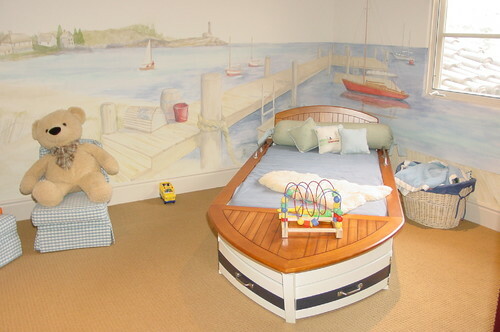 Or a ship shaped bed frame with anchorage or ocean wall murals. Second playground bedroom design is using field as the background and complete it with sport stuffs. Ask your kids about their favorite sports than decorate their bedroom using the sport they like. For example, if your kids love football, you can place a mat or carpet with football field pattern inside the bedroom complete with the hurdle. Or a basketball field with a basket in the wall. Let your kids playing inside the room with balls you placed there. Or if your kids are smaller, as the last playground bedroom design you can place a bed frame with ladder and slide board in different sides. Let your kids climb up to their bed and get down from the slide board. Then you can place some toys or the other stuffs under their bunk bed. Beside retrench the place, this playground bedroom design enables you to control your kids when they are playing in their bedroom. Need more great design ideas on Playground Bedroom Design for Kids? See our full gallery!